Select-Your-Gift offers many level-based catalogs, each providing a wide range of popular life-style items. Each catalog offers a large number of popular life-style items for the employee to select from. Today, most Service Award programs use Award Catalogs to offer the employee a choice of their gift within a specified price level. When thinking of gifts to give employees, keep in mind that they prefer and appreciate having a choice of gift they'll receive. With this program, employees receiving an award can select the perfect gift for themselves. Using the provided unique redemption code, employees can redeem using the service awards catalog and mail-in card, or they can alternately redeem online, accessing the same level of the awards catalog. The online version of the service award catalog offers the employee an even larger selection of gifts. Select-Your-Gift, is a Service Awards supplier serving thousands of clients across the United States. We offer an easy to administer service recognition program so that you can give gifts to employees, with all-inclusive pricing, and no surprise charges. You simply select the tier-level package pricing that fits each of your Service Anniversaries (1, 3, 5 year, 10 year, etc). 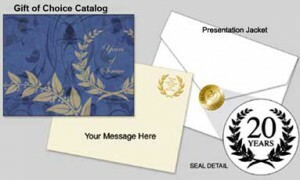 Our service award catalog level-based pricing includes the cost of the gifts to employees, the shipping of the gift to anywhere in the lower 48 contiguous United States, and the complete award presentation packet with a postage paid redemption card, instructions to alternately redeem online, and toll-free employee support number to handle all employee questions about their redemption order. See detailed information about our Employee Service Award program.